Mr Topper is not a clown that deals in laughter, he prefers screams! You’ll remember the terrifying events of last year when Mr Topper’s tricks went horribly wrong… this year, his clowning has become even more TWISTED! 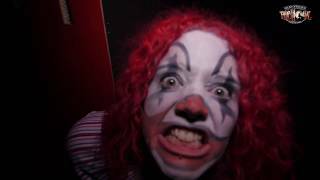 With creepy clowns at every pitch black twist and turn, it’s not one for the faint hearted!